Vibrant, colorful and trendy, The Popsicle Studio is a happy place for children to explore their creative abilities, and in time strengthen them. Do you believe that there is more for your child outside of the classroom? Well, The Popsicle Studio believes the same. 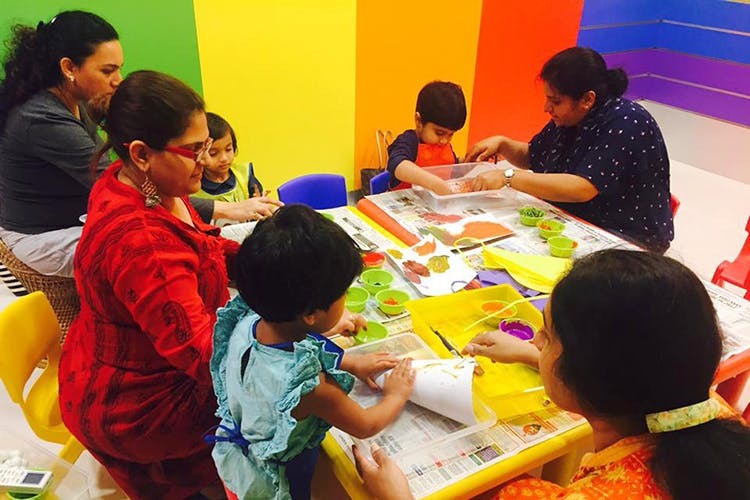 Predominantly an art studio, this is a space for children from 6 months to 12 years to experience all round development through art and craft. And as all things creative should start, this one too begins with kids getting their hands dirty with paint and clay dough. Not just because it’s fun, but rather that it helps little ones go through a process of understanding how the world functions, and how life skills can and in time, will be used to express art. Don’t we all know how the monotonous regime of school can get boring. And how! That is exactly why, this studio also has a host of classes that go well beyond what a school would teach your child. From movement classes for toddlers, storytelling sessions and music encouragement classes, treat your child to an hour of uninhibited expression and loads of fun. We’re so tempted to sign up ourselves. Coming soon are classes in making safe and healthy products such as lip balm and creams. All purely made from natural ingredients, of course. Oh and did we mention, they also provide a space for children’s birthday parties. They’ll even include a special return gift that is useful to the kids. And parents, if you ever need to just take a break for a movie date, or are simply too tired to run after junior, fear not. Just drop off your kids and enjoy some ‘me’ time. From experience, you won’t even be missed! They also have a cute little store that stocks hand-crafted merchandise like wallets, bags, and toys. Plus, swimwear, apparel, accessories and games for kids.